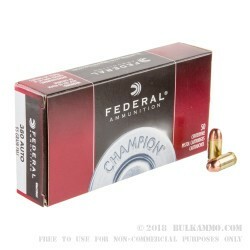 This Federal Champion 380 Auto ammunition is an easy choice for those who want .380 ACP rounds for range use and for basic plinking / target shooting. 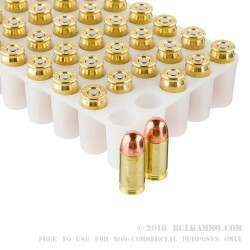 This load will easily function in a larger percentage of the market offerings than most other .380 ACP rounds. 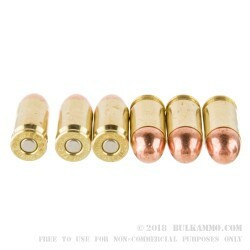 .380 auto tends to be a hard to feed caliber, as the springs seem to conflict with the recoil profile, and the general sizing of the guns that offer a .380 ACP are too small to even out that conflict. This happens to be a very good round for those troublesome guns as it is hot, but not too hot, and offers a smooth cyclic action. While it’s hard to guarantee any .380 having optimum performance, this is a very good round if you are having trouble with your smaller guns. 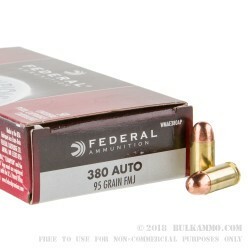 The 95 grain projectile smooths out the snappy reaction to the ignition, and the full metal jacket round ball profile offers the best chance for feeding onto tiny feed ramps as is the standard in the majority of small .380 Autos on the market. The brass casing offers a good surface finish and the consistency coming out of the Federal factory means you get the best chance for your gun that needs to be broken in.